Provides an overview and theory of the case. Discusses the issues, the parties, and the burden of proof. Organized to maximize the decision maker's comprehension and retention while telling a coherent story. Topics arranged in a persuasive sequence with logical transitions. Words and phrases advance the opening's purpose. Conflicting or negative evidence is handled in an effective manner. Tone, pacing, voice and body language enhance the opening. 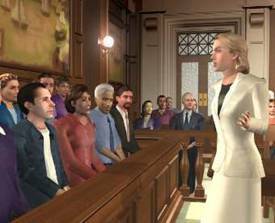 Opening statements are as important in an administrative hearing and a judge trial as it is in a jury trial. Most of the materials on opening statements discuss them in terms of a jury trial, leaving the impression that openings are unnecessary in a judge trial and absolutely forbidden in an administrative hearing. Whether they admit it or not, judges can be persuaded by a brief, organized opening. It may be more difficult to convince a judge or administrative law judge of the value of an opening in the abstract. If your openings prove to be helpful to the judge, however, you may find your opening is not resisted but heartily welcomed. In the beginning, you may have to devise a strategy for getting the judge to listen. One approach might be to say that in the interest of time you'd like to briefly clarify the issues before you question your witnesses. Contrast this approach with a request like, "Your honor, I'd like to present my 20 minute opening statement." Also be aware of any tendency you may have to refrain from making openings because "no one else does it" or you want to appear to be a "good ole boy or girl" who "knows the ropes." Your main concern should be presenting the best case on behalf of your client. In his book, Trial Advocacy (West 1975), James Jeans, a renowned trial lawyer and advocacy teacher, talks about these attitudes as the tendency of lawyers to "mimic mediocrity." The skills involved in making an opening statement are outlined in Opening Statement Skills below. Some experienced advocates begin to visualize their openings immediately after the initial client interview. They add polish and shine after they have written their closing and outlined the direct and cross-examination in their case. The materials in Chapter 10 Trial & Hearing Notebook suggest a way to prepare openings. The Opening Statement Worksheet contains key words and phrases where you can jot down your thoughts during the life of your case. The Opening Statement Outline suggests an order in which to present your opening. As you get closer to the hearing or trial date, you can translate your Opening Statement Worksheet notes into a more linear format. Finally, you can write out or put key words and phrases in the Opening Statement Form with added pages if necessary. All openings should be prepared in advance and practiced. You should not read the opening, but deliver it in a persuasive way that is consistent with your style and the forum where you are presenting it.